Elite Foodservice Design believe the system offers the best possible protection against bacteria, bugs and vermin. Altro’s integrated floor and hygienic wall cladding system makes cleaning easier too. Altro have specifically designed an integrated system to address the issues commonly found in kitchens – slips, contamination, cleaning and maintenance. The system doesn’t just protect the people who use it; it also protects the environment and those responsible for the health and safety of employees and visitors. But safety is not the only consideration. Altro Whiterock and Altro Stronghold 30 work together to give you a varied and exciting colour palette. So from traditional to contemporary, you can go as bold as you dare. Employers are required to ensure the health and safety of all employees and anyone who may be affected by their work. They must assess risks, including slip and trip risks, and take action to control those risks. Floors must be suitable, in good condition and free from obstructions. Altro Stronghold 30, our specialist kitchen safety floor, has a Pendulum Test Value (PTV) of ≥55 / R12, meaning it goes that extra mile and is proven to provide the highest level of safety and slip resistance. What causes you to slip? Contaminants (water, oil, flour) create a film between the floor and your shoe or foot. A film as thin as 1/10th thickness of human hair can be enough to prevent complete contact between shoe and floor, causing an accident. The shape of the aggregate in Altro Stronghold 30 protrudes through the surface of the floor, creating a grip on the sole of the shoe and preventing an accident. Food and drink preparation and cooking areas can spell danger. Grease, fat, cooking oil, flour, milk, food particles and the occasional chopped carrot – all can end up on floors and walls. Altro’s sustainable, integrated safety floor and hygienic wall cladding system provides long-lasting, safe and hygienic surfaces for wet, dusty and greasy conditions. The standard pendulum test for shod slip resistance uses water. Test results are rated with a PTV reading; a reading of PTV≥36 represents a one in a million chance of slipping on a wet surface. A wet surface only covered in clean water, that is. Water only represents a small proportion of the hazards a kitchen worker would encounter on a daily basis. So Altro decided to put the floor to a real world test: using a variety of different contaminants found in a commercial kitchen. The reality is kitchen workers are busy. Oil evaporates into the air and settles on the floor when it cools – requiring constant cleaning to prevent a slippery surface. Small spills like milk or flour could cause a very real slip hazard. A busy lunch hour would mean a lot of oil and cooking ingredients on the floor, and not enough time to keep the floor as clean and hazard-free as you would ideally like. Tests prove different contaminants pose different challenges. Whilst the risk from vegetable oil may come as no surprise, the other most significant danger comes from greasy water – and what kitchen can avoid that? Keeping people safe isn’t just about slip resistance and cleaning. It’s about preventing surfaces from harbouring bacteria. Altro’s integrated hygienic wall cladding and floor system is tankable. It has impermeable surfaces, which are easy to keep clean. With regular cleaning and maintenance using traditional solutions, Altro floors and walls do not allow bacteria to hide and grow. With the addition of Altro Whiterock hygienic ceilings and Altro Whiterock hygienic doorsets, it creates a fully sealed room. It’s so tough, you can power wash all surfaces if you want to and not cause surface damage that can lead to bacterial growth. So when you have a clean kitchen, you have a safe and hygienic kitchen. Altro integrated solutions: nowhere for bacteria to hide. Altro have designed a fully integrated system to make cleaning and maintenance easier for you. Surfaces are watertight and fully sealed around fixtures and fittings, with the sort of detailing that bacteria and micro-organisms just hate: helping maintain the strictest levels of hygiene. It also makes your surfaces easy to keep clean, making it a pleasant environment for your staff and which looks good at inspections. It means you will enjoy the long-lasting hygiene performance of our products. Altro products are non-porous and non-shedding, so nothing can get in or out. And because they have high impact resistance, damage that can trap bacteria is unlikely. •chemical, physical or allergenic risks, caused by ingredients, handling, equipment or fittings, including floors and walls. 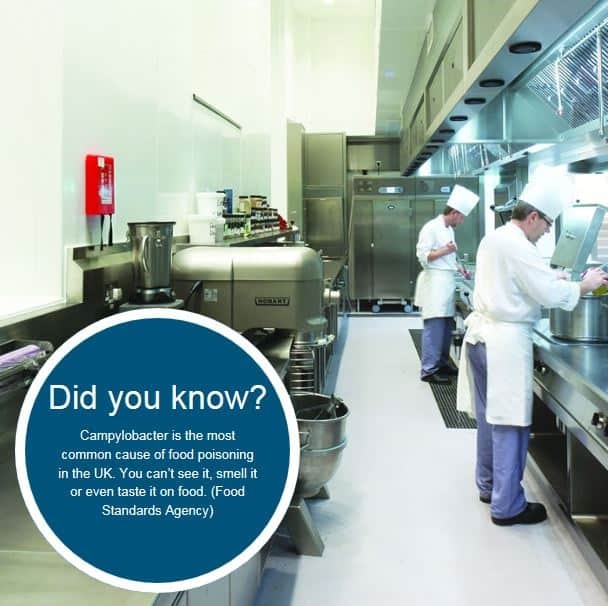 You can reduce hazard risk and keep inspections to a minimum by selecting Altro floors for kitchens and hygienic environments and hygienic wall cladding, which are all approved by HACCP International. "Altro products are one of the few worldwide flooring and walling products to have achieved HACCP International certification for non-food services and supplies, which means that they have been assessed by a third party and found to be satisfactory and hygienic for use in a food environment. Both the flooring and walling products from Altro offer the seamless and impervious solution which means that there is nowhere for bacteria to hide, as well as being easy to clean, both important issues in the food industry." Walls and surfaces must be kept clean and hygienic to ensure the safety of your customers and workers. Tiles can look great but there is more to hygiene than meets the eye. Tiles and grouting are porous, making them more susceptible to harbouring bacteria. They also chip and crack more easily, allowing dirt and bacteria to collect and hide from cleaners. Grout lines are particularly vulnerable and even epoxy grout is susceptible. The Altro Whiterock wall cladding system has an extremely high impact resistance according to BS EN438-2-1991 Steel Ball Test. Impacts that would leave ceramic faces vulnerable to water ingress barely leave a scratch on this tough surface. The same is true for the cladding’s thermoformed corners – an area where ceramic tiles are particularly vulnerable. Altro Whiterock also has an excellent Fire Rating: Altro Whiterock White and Altro Whiterock Satins have been assessed to EN13501-1 and obtain a Euro-classification of -s3-d0. With the range of colour from Altro Whiterock White and Altro Whiterock Satins, you can have the colour range choices that tiles provide, without the worry of contamination. As a result, businesses can enjoy reduced long-term maintenance costs, with a significantly reduced risk of contamination or, should the worst happen – an incidence of food poisoning occur – possible litigation or even closure. All this makes it perfect for use in any catering area. Water underfoot is treacherous enough – add grease, oils and fats, and you’ve got a dangerous environment. 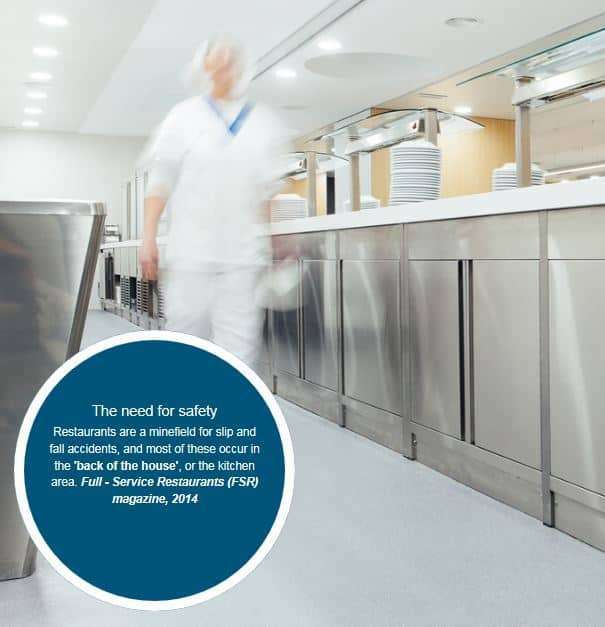 So, for commercial kitchens, canteens, food preparation and service areas, it’s essential to select a floorthat will help catering staff do their job safely. Altro Stronghold 30 achieves Altro’s highest rating for slip resistance (PTV≥55 / R12) and tests prove it minimises risk in wet and greasy conditions. As well as helping to keep staff safe from slips, it also helps reduce their fatigue, thanks to its 3mm thickness which provides noise reduction and comfort underfoot. 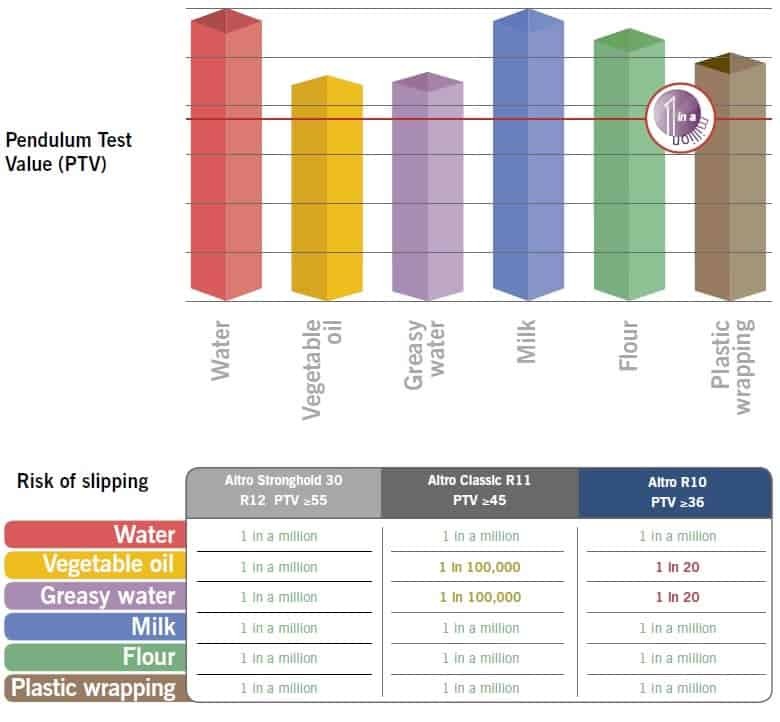 Thinking of replacing ceramic wall tiles with a HACCP approved, high performance option? 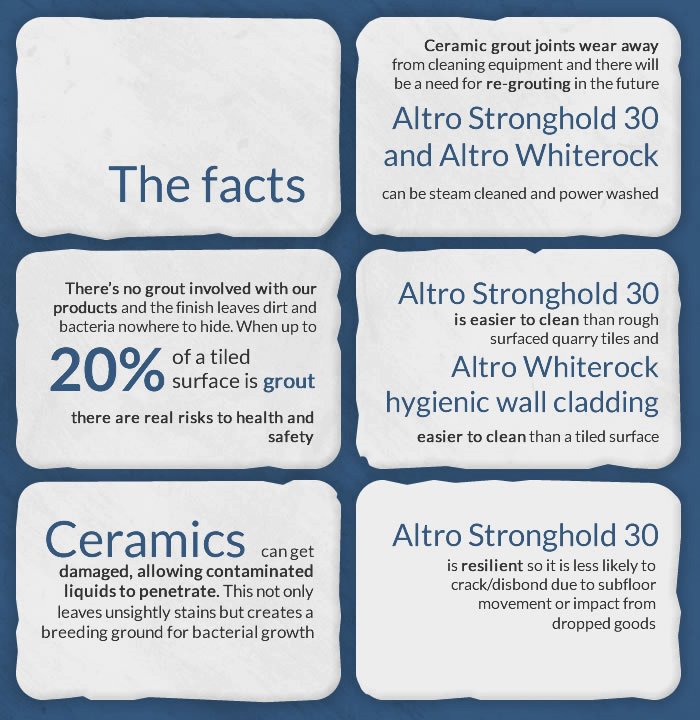 Consider Altro Whiterock White – the hygienic alternative to tiles that’s impact resistant, grout-free and easy to clean. Its smooth white surface and classical purity make it a timeless choice for any interior. Altro Whiterock White is made from a high-quality, food-safe PVCu polymer that can handle temperatures up to 60°C, and meets all current EU Directives on health and hygiene. This makes it particularly suitable for use in commercial kitchens. Use colour to subtly create a mood with Altro Whiterock Satins. This versatile and sophisticated wall cladding is available in a range of 26 solid, decorative, satin shades – from soothing through to stimulating. Of course, Altro Whiterock Satins still provides the impact resistance and hygiene you would expect from Altro Whiterock, with a stain-resistant, wipe-clean surface. Altro Whiterock hygienic ceilings meet rigorous hygiene requirements and are particularly suitable for food preparation areas. They form an impervious, hygienic, virtually maintenance free system which can be hosed down in situ and provide a bright, durable surface which helps reduce condensation. They can be installed as a fully suspended system. When hygiene really matters – every detail counts. Altro Whiterock hygienic doorsets provide a complete PVCu-faced doorset to ensure the integrity of your hygienic, low maintenance installation. They can be designed for use on their own or as part of an Altro Whiterock complete system including walls and ceiling. For commercial kitchens, Stainless Steel Splashbacks provide a hygienic and heat-resistant wall surface for cooking areas. Supplied with Altro Whiterock transition trims, they are a part of an integrated wall cladding solution. Big chunky details get broken easily. They’re also hard to clean. Some wall cladding joint strips and wall / floor transition strips frequently have really horrible grease behind them when taken off the wall during refurbishment, hiding not only contaminants but bacteria as well. By welding or using Altro Whiterock FlexiJoint, Elite Foodservice Design can completely seal and make impervious to contaminants, including bacteria, water, oil and grease. Corners suffer a lot of pounding. For these areas we use a butterfly weld, which is more robust if knocked. It is our preferred method for demanding areas, including kitchens. A hygienic wall or floor on its own is not enough; the transition between the two must also be sanitary to create a hygienic envelope from floor to ceiling. Transitions must also be watertight and seamless. The very sanitary way EFD join materials is to use a heat weld. The process of heat welding presses the molten weld rod (usually made out of plastic) into the grooves of the material fusing the material together. This creates a water tight joint and prevents moisture ingress. To create an impervious environment, we recommend you cove the flooring to join with the wall covering and heat weld the transition between the two. By creating a seamless, watertight environment from the floor to the ceiling, you can help minimise the areas in which bacteria will grow and where moisture can get trapped and cause damage to the substrate. Using appropriate drain and cove details, Altro Stronghold 30 helps function as a water-proof membrane against leaks to spaces below. Using clamping style drains allows water and spills to feed directly into drains without puddling, improving hygiene and making cleaning quicker and more sanitary. Altro Stronghold 30 can be used with a wide range of both clampable and welded drain systems and access hatches. In so doing, you can minimise trip hazards in a busy kitchen environment and allow the easy removal and opening of hatches without damaging the floor.